Disorder and chaos are interesting phenomena. Calculating the amount of entropy, information, or disorder in an information stream or data collection has many interesting applications. libdisorder provides a simple C library for calculating classic Shannon entropy (more to come in future releases). You can retrieve the source from github.com or dyne.org via git over SSH. I plan to push changes to both these repositories. Thanks particularly to jaromil at dyne.org for volunteering to host the repository. NB: The current best available version is 0.0.2. This page also provides older versions, but these are known to contain bugs. Version 0.0.2 includes a bugfix related to counting the number of tokens in a sample. It also introduces a command line tool ropy that scans a file (named on the command line) and reports bits of entropy. 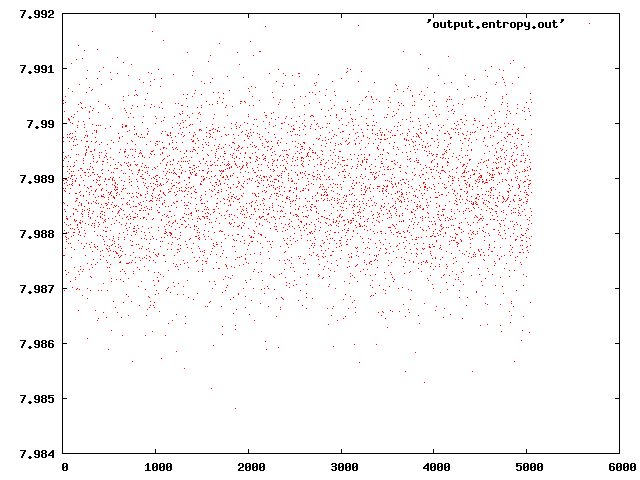 The image above is a gnuplot of about 5000 trials of reading /dev/urandom into an 8K buffer. Entropy remains fairly high, very close to 8. This imagine is not cropped (i.e., all observed values are plotted). This data was collected using the test.c program in the libdisorder tarball. If anyone wants to write a manual or info page, please feel free. It takes a byte buffer and a length argument and returns a float indicating the number of bits of entropy in the byte buffer. The return value should be a real number between zero and eight. The library also returns the maximum entropy for the data collection as well as the ratio of the entropy to the max entropy. NB: this code assumes that a token is defined by a sequence of 8 bits; thus, the entropy of a collection of these tokens has a maximum of 8. I'm contemplating methods to use other bit collections as the basis of a 'token'; with a different definition, we would see other maximum values for entropy. Email me with questions, comments, patches, or requests. You can reach me by using my first name at this domain or my last name at ucalgary.ca.